Ramsgate Seaside Shuffle Jazz Festival. Laurie Palmer takes Stage One. Jazz&Jazz Copyright © 2011 Peter M Butler. All rights reserved. 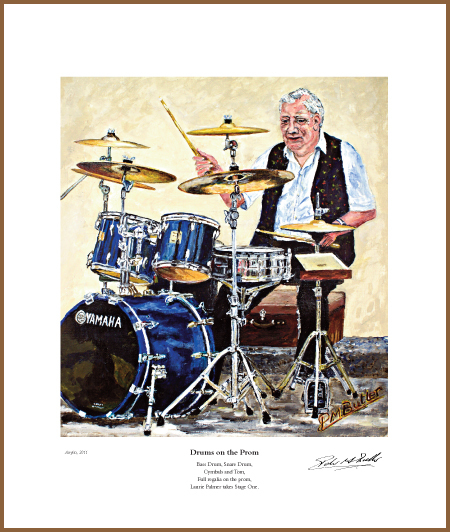 Fine Art Giclée Prints of this portrait are available, with or without the descriptive poem. Simply email: peter@jazzandjazz.com to place your order and help support jazz. Gerry Birch launched Thursday Night Jazz at The Star, Old Wives Lees, near Canterbury, Kent, over a year ago. The sessions are going from strength to strength and feature Gerry’s own Stour Valley Jazz Band along with other Kent based bands including Anything Goes, Vocalion and Tuxedo. So Gerry asked Jazz&Jazz to help spread the word about The Star’s Yule Tide Jazz Party. Just to let everyone know, the Jazz Christmas Party at The Star is on Thursday, 20th December. Please come along and bring an instrument if you can. Bring your friends too. Our welcoming publican Barry wants to continue the Jazz next year and it would be great if we could all put on a good show for him. Light refreshments will be provided. This will be our last Jazz Session for 2012. We start again on 10th January 2013. 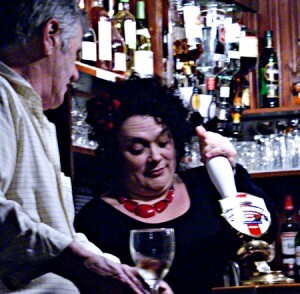 Thursday night at The Star is becoming a top jazz attraction in East Kent. Newcomers are most welcome so don’t miss out. So if you are an East Kent jazz fan and are within striking distance of Old Wives Lees, be there. 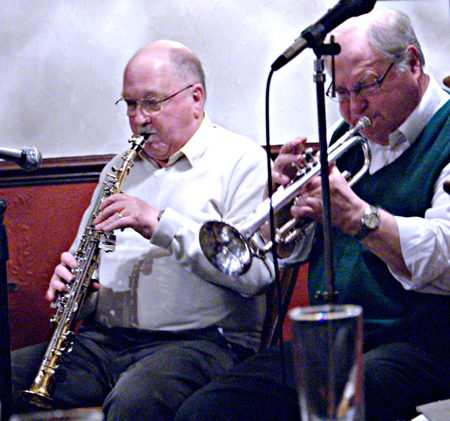 You will be warmly welcomed to the trad jazz festivities by The Star’s regular jazz fans. For further details and directions email Gerry at info@gerrybirch.co.uk or call The Star on 01227 730213. 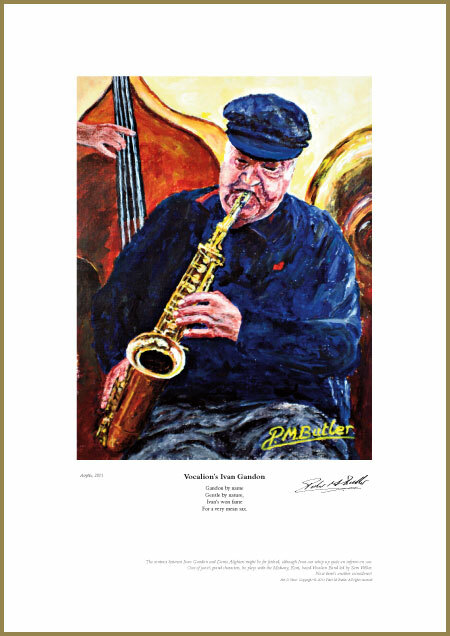 Jazz&Jazz Portraits make great gifts if you are stumped over what to give your jazz friends. And your purchases will help promote traditional jazz. Good reason for fans to linger a while. 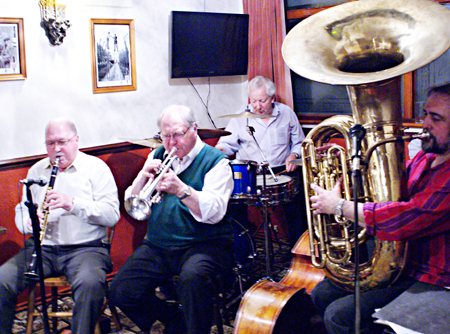 The Vocalion Band, led by Sam Weller, hails from Medway, Kent, and is a favourite with trad jazz fans. In this acrylic jazz portrait Sam is playing alongside drummer Mark Alexander at The George in Shalmsford Street, Chartham. For a very mean sax. Puts the best to shame. One of jazz’s grand characters, Ivan Gandon plays sax and clarinet with the Medway, Kent, based Vocalion Band led by Sam Weller. 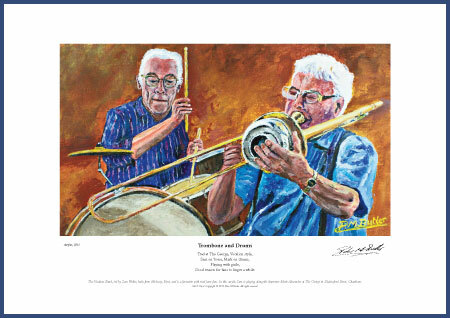 This is one of my favourite jazz paintings. Gerry Birch hails from East Kent where he repairs brass instruments and leads his own band, The Stour Valley Jazzmen. A friendly setting for jazz paintings, The George in Shalmsford Street, Chartham, Kent, is a regular venue for his trad jazz club. 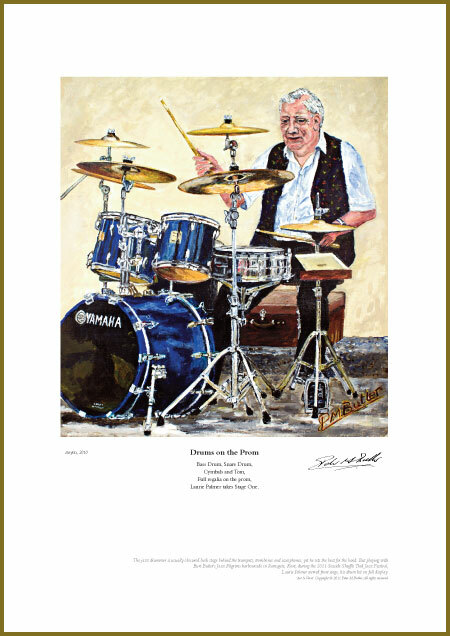 Laurie Palmer, drummer with Burt Butler’s Jazz Pilgrims, commissioned this jazz portrait of him on drums during the festival. The jazz drummer is usually obscured back stage behind the trumpets, trombones and saxophones, yet he sets the beat for the band. 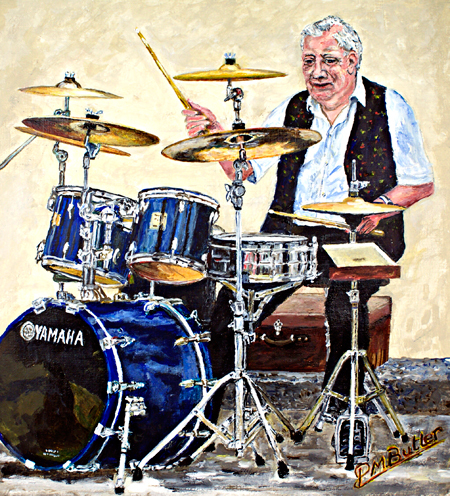 But playing with Burt Butler’s Jazz Pilgrims harbourside in Ramsgate, Kent, during the 2011 Seaside Shuffle Trad Jazz Festival, for his jazz portrait Laurie Palmer starred front stage, his drum kit on full display. ‘Art & Verse’ Copyright © 2011 Peter M Butler. All rights reserved. Fine Art Giclée Prints of my portraits are available, with or without my descriptive poem. 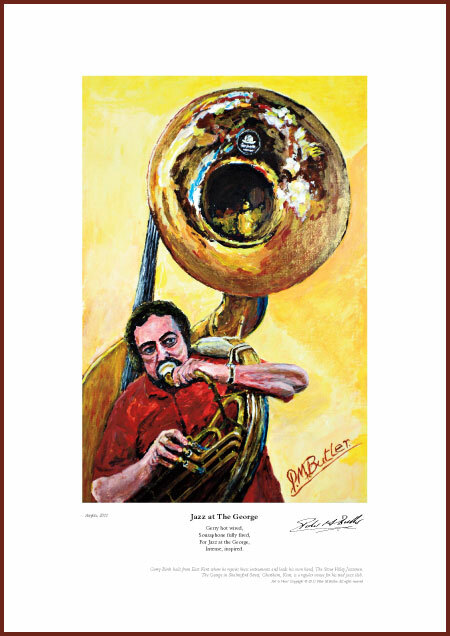 Simply email: peter@jazzandjazz.com to place your order and help support jazz.